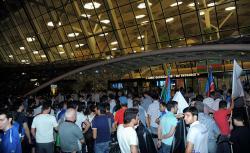 Azerbaijan's record-breaking Olympics team arrived back from Rio to jubilant scenes when they landed in Baku this night. The 31st Summer Olympic Games in Rio went down in the history of the country’s sport as one of the brightest Olympic pages. The national heroes claimed 18 medals, thus securing the country’s biggest Olympic medal haul for the past 25 years of Azerbaijan’s independence. 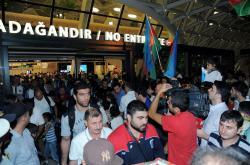 At the Heydar Aliyev International Airport, Azerbaijani Olympians were solemnly welcomed by their family members, representatives of sports community and Baku residents. Radik Isayev (80kg), who brought Azerbaijan its only gold medal from the Rio Olympics, congratulated the entire Azerbaijan. 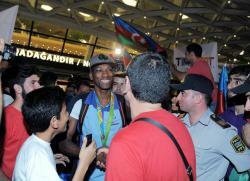 “The entire country needed this medal, and I think we've captured it with common effort,” Isayev, 26, told reporters in Baku airport upon arrival from Rio. The Rio Games opened a new page in wrestling for Azerbaijan. The country sent 14 athletes to Rio, while they secured nine medals in Summer Olympics. 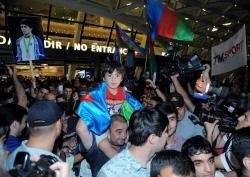 Azerbaijani freestyle wrestler Toghrul Asgarov (65kg), who captured silver, said he was glad to return home with a medal. “I am glad to come back with a silver medal, but I could've won gold,” said Asgarov, 23, who lost in the finals to Russia's Soslan Ramonov. Freestyle wrestler Haji Aliyev, returning home with bronze, said his next aim is the 4th Islamic Solidarity Games to be held in Azerbaijan in May, 2017. “We have the Islamic Solidarity Games ahead, and this is our main goal,” Aliyev, 25, emphasized, adding that he plans to perform well and get another medal. Head coach of Azerbaijani freestyle wrestling heroes, Firdovsi Umudov, for his part, said that all the victories of Azerbaijan at the Rio 2016 Olympics, the team devotes to memory of martyrs. "By capturing five medals in six weight categories, we took the first place in team scores. I am very happy for our results, all our wrestlers were worthy of gold medals," Umudov said. "In the future we will continue to do our best. All our victories we devote to the memory of martyrs, including those who died during the April clashes with Armenia," he said. In Rio, Azerbaijan for the first time took medals in canoe, kayak and taekwondo, and for the first time reached the final in boxing. Azerbaijan’s legionary boxer Lorenzo Sotomayor, who won the silver medal, regretted not winning the gold medal. “The Olympics went on great for me. I wanted to return with a gold medal, but unfortunately, due to biased officiating, couldn't get it done,” Sotomayor said. Azerbaijani female taekwondo fighter Patimat Abakarova, who won the bronze medal, said that she is very grateful for the support of Azerbaijan's Taekwondo Federation. Speaking with Trend, Abakarova, 21, recalled her performance at the Olympics. Gymnastics was another sport where Azerbaijan hoped to succeed, but could not take medals. However, Marina Durunda was able to become one of the 10 strongest gymnasts reaching the final. “To participate in the Olympic finals of the Rhythmic gymnastics is a big honor, and it requires a lot of strength and effort,” Marina told Trend. The management of the Azerbaijani Gymnastics Federation, as well as the Ministry of Youth and Sports of Azerbaijan highly assessed the performance of Marina Durunda at the Rio Olympics, Head coach of Azerbaijani national team in rhythmic gymnastics Mariana Vasileva told Trend. 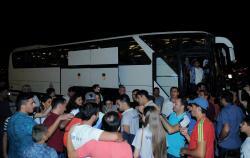 Right after landing in Baku, the national athletes visited the Monument to the National Leader Heydar Aliyev, and laid flowers there. With one gold, seven silver and 10 bronze, Azerbaijan was ranked the 39th in the medal table, while the national team become the most efficient team of the Games. The country has won 0.3 medals per athlete, with its relatively small team of 56 athletes. Azerbaijan is also among the top 15 countries for the total number of gained medals in the Games, which was attended by record 206 countries, alongside with the U.S., Britain, China, Russia, Germany, France, Japan, Italy, Australia and Canada. 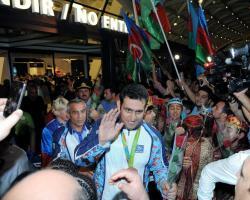 Moreover, Azerbaijan placed the 8th for the number of medals won per million inhabitants of the country. 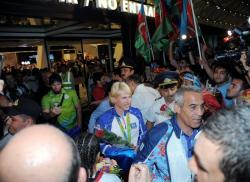 The Land of Fire earned 1.84 medals per million inhabitants of Azerbaijan. 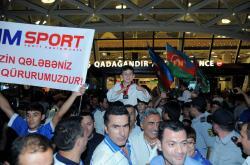 The Azerbaijani athletes left behind all CIS countries, except Russia, for the number of the secured medals. The country also won more medals than athletes from Spain, Turkey, Iran, Sweden, Denmark, Greece and others, despite the fact that they were presented in Games by more sportsmen. Thus, the number of medals secured by the national athletes is growing from Games to Games -- Atlanta - one, Sydney - three, Athens - five, Beijing - seven, London - ten and finally Rio de Janeiro - 18 medals.